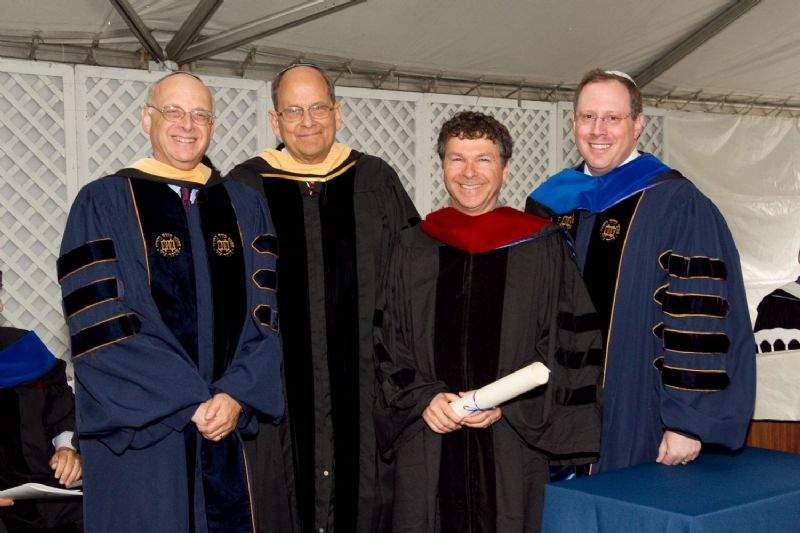 From left, Steven F. Windmueller, dean of the Los Angeles campus of Hebrew Union College-Jewish Institute of Religion; Rabbi William Cutter, Steinberg emeritus professor of human relations; Rabbi Eliot Baskin of Congregation Har Shalom in Durango; and Rabbi Aaron Panken, vice president of strategic initiatives at the college, celebrate Baskin's receipt of a doctor of divinity honoris causa. The ceremony took place Monday at the school in Los Angeles. school's New York City campus in 1993. Baskin has served Har Shalom on a part-time basis since 2004, where he has helped the congregation grow and thrive. new era of Congregation Har Shalom since Durango is too small to support a full-time rabbi." his career in Rochester, Minn., where he was the rabbi for B'nai Israel Synagogue and a chaplain at the Mayo Clinic. "I was ministering to the frozen chosen," he said. Nieberg Baskin and two sons, settled in Denver. works with the elderly, the ill, people in the hospital, Jews who are incarcerated and the mentally ill.
family have traveled the world while he leads worship with Jews on board. "I lead 'castaway Jews' stranded at sea," he says in one of his many one-liners. also includes Jews who follow the Conservative and Orthodox traditions. Orthodox traditions comfortable both on ritual and a community, cultural basis." vision quests and sandbar mitavah kayaking," he said. Baskin says he is inspired by the congregation in Durango. difficult in a small town. I'm in awe of what these people are doing." They are pretty impressed by him, too. "We are very proud of him," Flitter said.